10:00 - The Post Office Counter will be open in the Village Hall between 10.00 and 12.00. 10:30 - Informal Drop-In Coffee Morning at the Village Hall from 10.30 to 12.30. Tea, Coffee, Cake and Chat. Open to everyone. Children welcome. Transport available if required. Phone Margaret on 870083 for details. 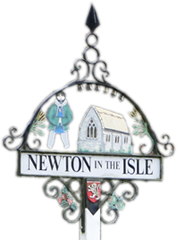 19:00 - Bingo Night in the Village Hall in aid of Newton Bowls Club. 7.00 for 7.30 start. Details from Jill on 871033 or Marilyn on 870133. 09:00 - The regular Holy Communion service in St James' Church. All welcome. 10:30 - Another chance to do your bit in helping to keep our village tidy. Meet at the Village Hall Coffee Morning at 10.30 for a cup of coffee and slice of cake, before heading out to pick up litter. Equipment provided. All welcome. 12:00 - An Open Afternoon at the Bowls Club behind the Village Hall from 12.00 to 3.00. Come along and have a go, meet the bowlers and join them for lunch. Everybody welcome, including children over 10, who must be accompanied. Flat shoes please. 19:00 - Quiz Night in the Village Hall in aid of the Friends of St James' Church. 7.00 for 7.30 start. Tables of 4 at £4 per head including refreshments. Bring your own drinks. Prize raffle. Contact Jenni on 588836 to book your table. 09:00 - A Morning Prayer service in St James' Church. All welcome. 17:00 - The deadline for articles for the May edition. 19:00 - The Ladies Club meets in the Village Hall for the Annual General Meeting with a delicious buffet supper. Everybody welcome. 12:15 - The Mobile Library will be in Goodens Lane opposite Colvile Road from 12.15 to 12.35. 19:30 - Monthly meeting at the Village Hall. All welcome. 14:30 - Informal Drop-In Afternoon Tea at the Village Hall from 2.30 to 4.30. Tea, Coffee, Scones, Cake and Chat. Open to everyone. Children welcome. Transport available if required. Phone Margaret on 870083 for details. 18:30 - Rural League fixture against BRSA. Spectators welcome. 10:00 - The Gardening Club's annual Seedling and Plant Auction, in the Village Hall. 10.00 for 10.30 start. All welcome. 18:30 - Young Shield match against Emneth. Spectators welcome.